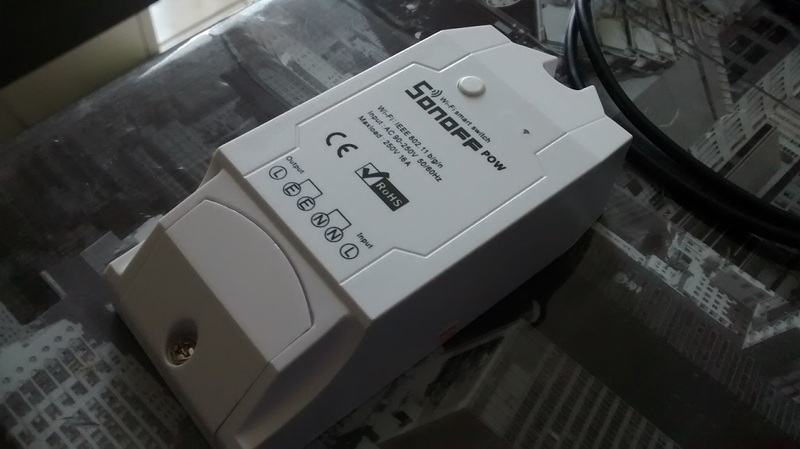 I'm ready to test TASMOTA firmware, just uploaded on my SONOFF POW. To perform the first test, I used a plug connected to the INPUT terminals of the SONOFF (L = Line, N = Neutral, E = Earth). Then I took an old lamp holder, connected to the OUTPUT terminals. Last thing to do...find a load...here is it...an old 100W bulb. I connected the plug and the SONOFF powered up. The blue led flashed a couple of times and then shut off. I discover how to use the button. In particular, the "4 short presses" procedure permits me to activate the access point and the integrated web server, so it becomes reachable and configurable. I typed the WiFi details, named the device, saved and restart. After a couple of seconds, the SONOFF joined my home WIFI network and takes a DHCP assigned local IP. Through this IP, I could get the configuration panel again. Reading the TASMOTA docs, I found a procedure to calibrate it. In the next step I'll try the MQTT protocol. After a rapid test with EWeLink App I'm sure the device is working well; I'm ready to upload the TASMOTA firmware, to enhance the sonoff functionalities, in particular the MQTT protocol. I open the website https://github.com/arendst/Sonoff-Tasmota/wiki, download the software and follow the step-by-step procedure. I like Arduino IDE and so I decided to use it, instead of PlatformIO, so I follow the section "Arduino IDE Preparation" on wiki (https://github.com/arendst/Sonoff-Tasmota/wiki/Prerequisite#arduino-ide-preparation). Now, it's time to solder the serial pins on the sonoff, so the board will be removed from the plastic case. In the Sonoff POW the serial interface is at the end of fhe board, near the phisical button. Using a MicroUSB - USB cable, I plug the adapter in the PC and install the FTDI driver. The sonoff must be restarted in "programming mode", keeping its button pushed for 2 or 3 seconds. If everything is OK, the device is ready for the firmware upload process. Using the Arduino IDE, in just a couple of minutes the firmware will be uploaded on device (see Upload). In simple words, they are low-cost wifi controlled relays. A basic switch is less than 5 euro! I bought them on eBay, for testing purpose. These devices are easily configurable and ready to use; just connect them to the power. The onboard firmware let them be controlled by a mobile APP (iOS and Android), called EWeLink. A step by step procedure helps user to pair the device to the home wifi network (mandatory...). The devices will be controlled directly through internet, using an Amazon AWS server managed by iTead. This is a simple and rapid mode to operate with these devices; but if your home network is offline, they stop working. So, my first step was googling for "Sonoff Firmware"...Bingo! At the first glance, it seems the most complete, for my purposes..It allows to control the device by MQTT, Web and Serial Communication. About MQTT, I can suggest you to take a look at the official website: http://mqtt.org. It is a very useful protocol to manage IoT messages. In a nutshell, MQTT is a connectivity protocol. It was designed as an extremely lightweight publish/subscribe messaging transport. It is based on a central service, called broker, which receives published messages and forward them to the subscriptors. Every message is published on a particular "topic" and only the subscriptors of that topic will received it. After choosing the firmware, just upload it on the chip. The custom firmware will be upload using the serial interface on the sonoff, through a 3.3V USB-Serial adapter. I bought one on banggood. You could upload the firmware using the Arduino IDE or PlatformIO. Please follow the step by step guide provide by the firmware developers. I chose OpenHab v.2; in my opinion it's the most versatile one (but I could be wrong :) ).